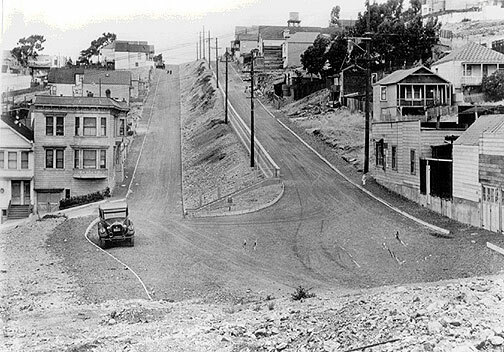 Around 1903, the Santa Fe Railroad removed a great portion of Potrero Hill. 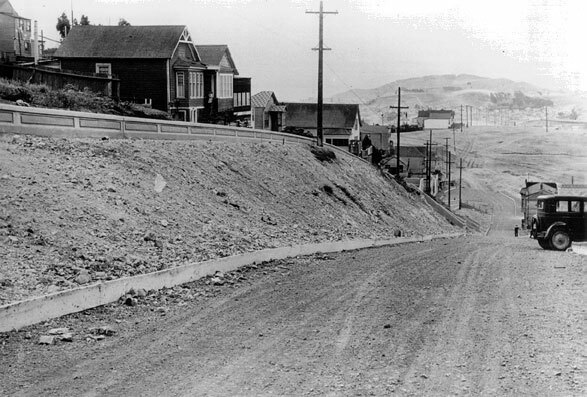 The portion removed came from the areas of Iowa Street extending east and then south to the area of twenty-second and Missouri. 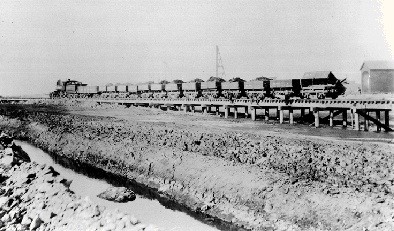 The dirt and rock were used to fill the marshland between Iowa Street and Massachusetts...The Southern Pacific Railroad similarly received a state grant to fill in Mission Bay. For twenty years, the bay was used as a dumping ground. Long Bridge, or Mission Bay Bridge connected Townsend and 2nd with Irish Hill. 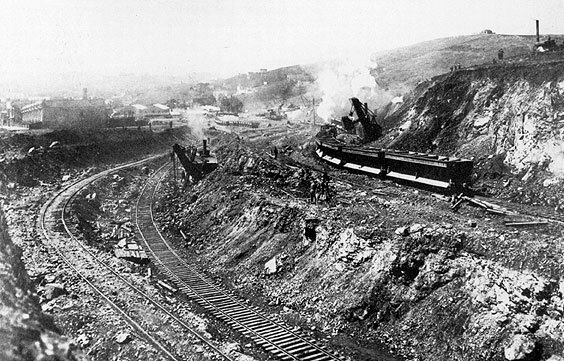 To reach the area further south, a deep cut had to be made in the hill along Kentucky and Twenty-Second Street. Close to the northwest corner of Connecticut and Twentieth in 1890 was a three-hundred foot well, which later had to be filled. 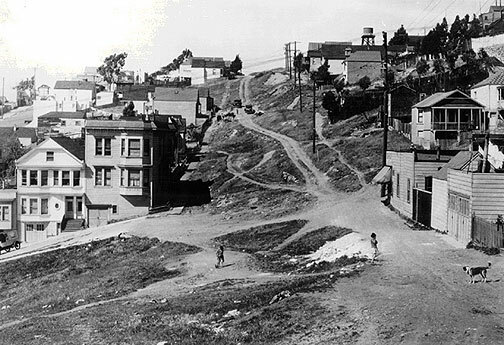 . . Outside on the south side of the Adams house at 18th & Pennsylvania were a spring and well. . .The well and springs also served as a fresh water supply for the many 1906 earthquake refugees, according to Mr. Thorburn Adams. . . .There were numerous springs on Potrero, and [today] several "Bani" steam baths are used by the Russian people. These were not open for public use, and it is difficult to learn the location of the bani baths. The only [visible] clue to the whereabouts of such a steam bath is a rusty iron stove pipe emerging from the roof of a hillside building. 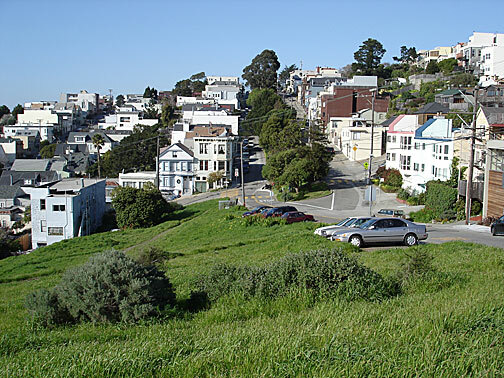 A resident of Potrero commented that if a person sneezed at the bottom of the hill on a quiet summer evening, the sneeze could be heard at the top of Potrero Hill. During the day, the hum of industry fills the air. In the evening, however, when the workers have returned to their homes, a new noise is heard over the hill. Across the valley floor of the old Mission Bay, stands the heart of San Francisco, and on a clear warm night, with the fog as a backdrop, the skyline becomes a huge amphitheater. The heartbeat of the city reflecting off the fog, bounces against the hill with a sound much like the sea, ever present as it rolls in. 1960 July: The Western Pacific tunnel gave way. Homes at Arkansas and 19th Sts. collapsed. Homes on Missouri between 20th and 22nd were damaged by cracks and settling. 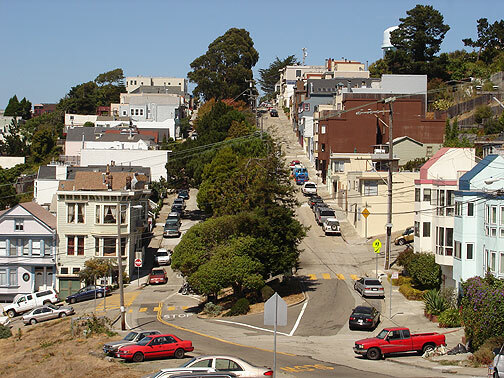 After much legal litigation, the tunnel was filled with cement and the homes made a comeback. 1967 March: The community turned out to help the Carolina St. neighbors landscape their divide strip between Southern Heights and 23rd. 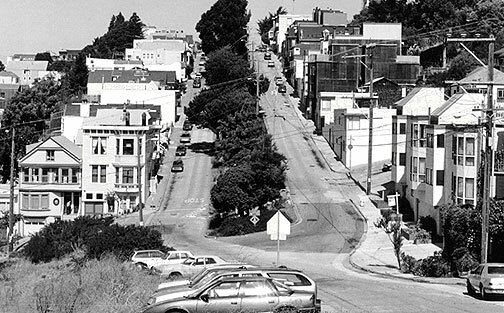 . . Carolina Street between 18th and 19th was vacated for the construction of the Potrero Hill Jr. High. 1967 April:--A special tree planting ceremony around the water department property at Carolina, 22nd and Wisconsin Sts. . . Southern Freeway construction causing damage to homes on the East side of Pennsylvania, including St. Teresa School. 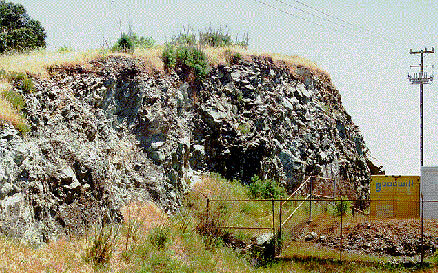 Large cracks appear due to slippage of earth. When the hill could not stand any more chopping away and had slipped to a dangerous point, home owners on Pennsylvania Avenue were given 30 days to vacate. 1971: "Fallen Bridge Park" at 18th and Utah Streets was dedicated with a good sized crowd on hand. So named because a dump truck had knocked the adjoining pedestrian overpass from its moorings three years ago. This was the first idea of using Freeway land for parks... A group of local residents designed, constructed and maintain "The Benches" park at the San Bruno Avenue entry to the overpass. . .